In a small bowl, whisk the apple juice with the soy sauce and vinegar. 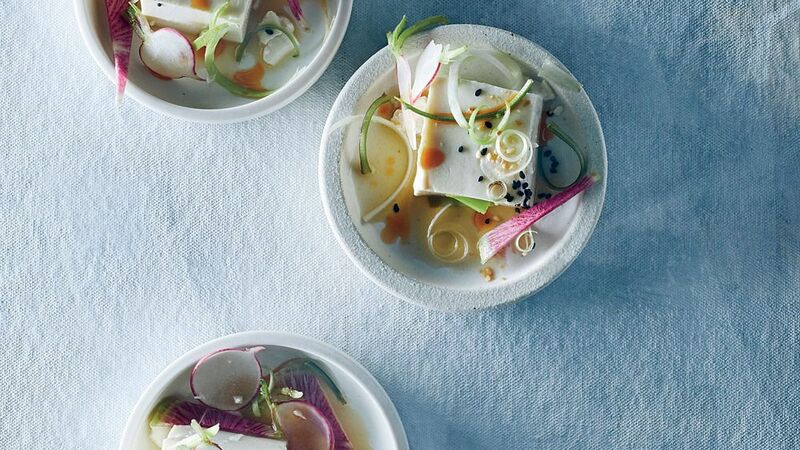 In another small bowl, toss the radishes with the scallion and cilantro. Refrigerate the sauce and slaw separately until they are nicely chilled, about 15 minutes. Divide the tofu among 6 bowls. Spoon the apple soy sauce on top. Pile the slaw on top of the tofu and drizzle each with 1/4 teaspoon of the hot sesame oil. Garnish with toasted sesame seeds and serve cold.